It is the first time in 60 years that the four-time champions have missed out on the tournament . 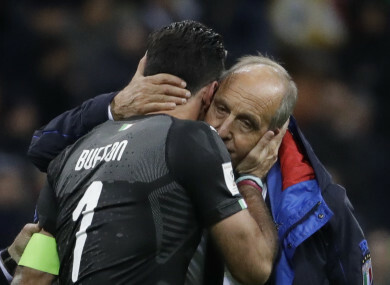 Ventura and retiring goalkeeper Gianluigi Buffon embrace. GIAN PIERO VENTURA has been sacked as Italy coach after the four-time champions failed to reach the World Cup finals. The veteran coach’s fate was sealed after a crisis meeting of the Italian Football Federation (FIGC) in Rome. The 69-year-old had refused to resign despite a 1-0 aggregate play-off defeat to Sweden on Monday saw Italy miss the World Cup for the first time in 60 years. Ventura had defended his leadership as “one of the best records in 40 years” despite failing to lead the 1934, 1938, 1982 and 2006 winners to their 19th World Cup. I lost only two games in two years,” he had told Italian television show Le Iene in a brief interview. Since the former Torino coach took over in July 2016, Italy have lost three matches — against France in Bari (3-1), Spain in Madrid (3-0) and against Sweden in the World Cup first-leg play-off in Solna (1-0) — winning nine and drawing four. Former Chelsea and Real Madrid boss Carlo Ancelotti has been touted by the Italian press as the favourite to replace Ventura, as the 58-year-old Italian is free since being sacked by Bayern Munich at the end of September. Email “Ancelotti favourite to take over Italy as Ventura sacked after failure to qualify for World Cup ”. Feedback on “Ancelotti favourite to take over Italy as Ventura sacked after failure to qualify for World Cup ”.